With the presidential election drawing the majority of media attention, local representatives tend to get lost in the coverage. 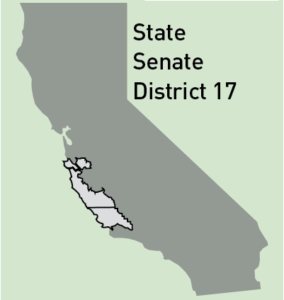 Representatives from the California Senate 17th District, which covers Santa Cruz, Santa Clara, Monterey and San Luis Obispo counties, and the California Assembly 29th District covering Santa Cruz, part of Santa Clara and Monterey counties, are up for re-election. *Senate and Assembly Districts are divided by population, and therefore do not align with counties or each other. Voters elected Mark Stone to the California Assembly in 2012, and he is the current representative. While in office, Stone served as chair of the Assembly Judiciary Committee and chair of Assembly Committee on Human Services. Prior to being elected, he was a Santa Cruz County supervisor, where he worked on health care, education, youth issues and the environment. Stone has made improvements concerning child welfare issues by leading policy decisions on foster care and developmental disability services. He fought illegal coastal development by holding hearings, investigating threats to the Pacific Ocean and working to prevent oil spills and offshore fracking. Sierra Roberts is a Republican from Marina, California. She is an entrepreneur and a graduate of California State University, Monterey Bay. Roberts has run a low profile campaign, with no information on her political views anywhere to be found, including her campaign website. However, she is polling at 25 percent among likely voters. Palmer Kain is the 2016 Republican candidate running for the California Senate 17th District. He ran for California State Assembly in District 29 in 2014 but was not elected. Kain is passionate about civil liberties, the right to bear arms and a small government. Prior to running for the Senate and Assembly, Kain was in the U.S. Army with the 1st Infantry Division, graduated from Cabrillo College and went on to receive his bachelor’s degree in Israel. If elected, Kain hopes to put more money into schools, keep non-violent offenders out of our jails and prisons, work to end the housing crisis and divert tax dollars toward local needs. Bill Monning, a Democrat and California’s current state Senate majority leader, is running for his second term this fall. Monning, who represents Santa Cruz, San Luis Obispo and part of Santa Clara and Monterey counties in the 17th District, got his start in politics in the California Assembly after working as a law professor in Monterey. In the Assembly, he helped pass the California Health Benefits Exchange (Covered California), which is a state-operated version of the Affordable Care Act. Since then, he has continued to focus on public health and the environment, co-authoring and passing the End of Life Option Act, which allows terminally ill adults to take life-ending prescription drugs.